LG 32LE4900 review | What Hi-Fi? You'll notice that the LE4900 comes with a slightly higher price tag than the £400 32LD490 we've also tested, but does that equate to an extra £150 worth of features, functionality and performance? Smarter-looking and thinner than the LD490, the LE4900 gets off to a promising start. It uses edge-lit LED backlight technology and claims a seriously impressive (and possibly a tad generous) 2,000,000:1 contrast ratio, compared with the LD490's 60,000:1. Look round the back of the set and you'll see a similar selection of sockets to those found on its sibling. But, the LE4900 does have enough space to squeeze in an extra HDMI input (taking the total count to four) and an extra USB socket (making two). Unsurprisingly, both sets share identical menus and use the same remote control, so there are no real surprises or issues as far as ease of useis concerned. 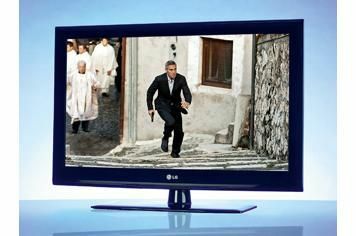 LG provides its own Picture Wizard to help you configure the settings, but as we've found with other TVs that boast similar help processes, the results are average at best. There really is no substitute for taking advantage of the THX set-up screen (such as that found with Star Wars or Monsters Inc DVDs) – and, of course, your own judgment. In some aspects, the LG proves quite the performer. It's a clear improvement on the LD490, producing a more convincing, detailed and punchy picture. Fire up Solomon Kane on Blu-ray and the LG does a good job of extracting detail through the driving rain and the dull grey skies. As the characters find themselves in darker confines, the LG shows greater black depth but gives an even better insight into the shadows. Torch flames burn brightly, with yellows and reds appearing piercing and extremely convincing. The edge-lit LED backlight remains well behaved, too, with only the slightest hint of its presence in the corners of the screen. DVDs are handled well and upscaled to a perfectly acceptable standard. But the LE4900 suffers from a similar problem to its stable-mate. The TV's inability to handle motion is disturbing and there's a serious amount of blurring and judder, most apparent during horizontal movement. It's distracting enough to knock a star off this TV's rating, which is a shame, because on the whole there's little else to moan about. The LE4900 produces a solid and relatively trouble-free Freeview HD picture. And, once you've calmed its sonic sibilance via the treble controls, the built-in speakers kick out a fairly lively sound.